Life’s a beach. I’ve walked on a few today. All of them clean white coral sand and deliciously warm surf. Unfortunately these lovely beaches are nowhere in the UK. I’m back in Barbados, visiting the same friends with whom I stayed 50 weeks ago, P&D. I arrived from London yesterday (Gatwick was 3C, Bridgetown 30C). No hassle with camouflage shorts this time around, so once I’d clear immigration and baggage reclaim I picked my rental car (a Suzuki Vitara) and headed to Bridgetown and Prospect where I’m staying. The sun was going down as I arrived in Prospect and I enjoyed a leisurely evening catching up with P&D. So, after returning P home and gathering up my bits and pieces, I set off on a ‘get my bearings’ day out. I headed east for St John’s Church, via Drax Hall, to see the grave of the country’s Prime Minister who died very recently. The attendant at the church told me that they’d had great difficulty locating a free plot in the historic graveyard (the oldest identified grave is from 1666!). After St John’s I needed to put petrol in the tank which meant heading back to Bridgetown as that’s where most of the filling stations are located on the island. Certainly my tourist map didn’t indicate any where I was. Since I was in Bridgetown I decided to go to the Barbados Concorde Experience. I saw Concorde at Heathrow many times, and recall it flying overhead at some point in the past, but I’d never been ‘up close and personal’. That was fixed today. And then I headed for the beaches. There are beaches everywhere. Along the east coast they are wide and wind-blown. Here the shore is pounded by the Atlantic (there’s nothing for 3,000 miles east to Banjul in The Gambia) and is consequently popular with surfers who come from all over the world. On the calmer south and west coasts, you can walk for miles along unbroken white sand beaches, though the way is often barred by clusters of coral rocks jutting out to sea which create delightful hidden coves. These are often difficult to access, or form part of some fabulous resort or private development, but it is still possible to find a beach all to one’s self. All along the shore large and small beaches are broken by coral formations, the soft coral rocks weathered by the ocean surf, forming abstract sculptures pleasing to an artist’s eye. In the north, coral and sandstone cliffs rise straight out of the sea reaching up to a hundred feet in height. But even here, you’ll find the occasional sheltered cove. 1. A walk on the beach at [the ridiculously expensive] Crane Resort. Yes its quite something but there are better beaches, almost within spitting distance, that remain unspoilt by such development. Not my kind of beach – by a country mile! 2. 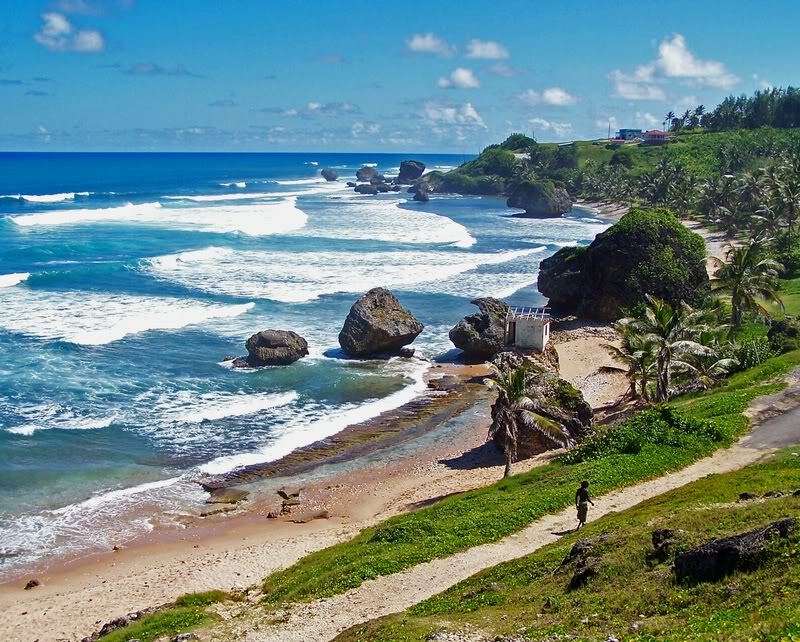 A walk on the fabulously unspoilt Bathsheba beach – a sharp contrast to Crane and much more to my liking. 3. Several rum punches and lunch at The Round House overlooking Bathsheba’s pools (see previous link for details). This was my favourite eatery on my last visit, and when it comes to location, only Applecross in Scotland beats it for sensory delight. 4. A walk on Brandons beach on the outskirts of Bridgetown. The cruise ship terminal is visible away to the south, and this afternoon I was able to see Queen Mary 2, Independence of the Seas and a ‘Celebrity Cruises’ liner that I did not recognise, plus a traditional four-masted schooner berthed near (and dwarfed by) QM2. Then it was back home to check out all my photos and decide what to do tomorow (a walk along the beach before the sun gets too high, application of copious quantities of Piz Buin by the pool, and later a visit to a Barbados Horticultural Society open garden).